The Small Magellanic Cloud (SMC = NGC 292 = Nubecula minor) is an irregular dwarf galaxy. It has a total mass of approximately 7 billion times the mass of the Sun. At a distance of about 200,000 lightyears, it is one of the Milky Way's nearest neighbors. 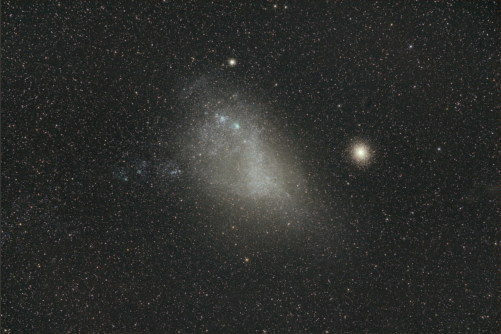 The SMC forms a pair with the Large Magellanic Cloud (LMC), which lies a further 20 degrees to the east (not visible in the above image). The bright globular cluster visible in the above image is NGC 104, also known as 47 Tuc. With a distance of 17,000 lightyears, NGC 104 is 10 times nearer than NGC 292.